Pirate Treasure Map invitations. 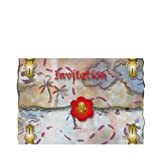 Pirates love searching for hidden treasure, so why not send out invitations that look like treasure maps, with directions to your home or the party venue. Pirate Party Treasure maps are easy to draw and don’t forget that X marks the spot. If your map-drawing talents aren’t that great, then print out a Google Map in black and white, tear the edges and stain the paper with cold tea and roll it up like a scroll to give it that authentic pirate map look. Message in a bottle. Collect small, clear plastic drinks bottles. Water bottles are ideal. Take off the label by soaking them in warm soapy water and write your party invitation on a small piece of paper, roll it up and pop it inside. Jolly Roger Flag with a Scull and Crossbones. Use readily available images from the internet to add a Jolly Roger Flag and Scull and Crossbones to your party invitation. Use a script type font to give it that Pirate look. Don’t forget to include the date, start time, end time and location of your pirate party adventure. This entry was posted in Boy's Party Ideas, Kids Birthday Parties and tagged 1st birthday, 1st Birthday Party, 1st Birthday Party Ideas, 1st birthday party supplies, birthday decorations, birthday party decorations, birthday party ideas, birthday party supplies, birthday party themes, birthday pirate, birthday supplies, Boys Birthday Party themes, Cheap Party Supplies, Children's party supplies, childrens parties, childrens party, halloween party, halloween party ideas, halloween pirate costumes, ideas for a pirate party, ideas for pirate party, Kids birthday parties, kids birthday party, kids birthday party ideas, kids parties, Kids Party, kids party games, kids party ideas, Kids party supplies, kids party themes, kids pirate game, latest party themes, party america, party bags, party box, party city, party decoration ideas, party decorations, party favors, party games, party ideas, party ideas for kids, party invitations, party land, party packs, party pirate, party pirate games, party place, party shop, party store, party suplies, party supplies, party supplies uk, party themes, party time, pinata, pirate and princess party, pirate birthday, pirate birthday cake, pirate cake, pirate cakes, pirate costume ideas, pirate costumes ideas, pirate decorations, pirate dress up, pirate fancy dress costumes, pirate food, pirate games, pirate invitations, pirate parties, pirate party, pirate party accessories, pirate party game, pirate party games, pirate party ideas, pirate party invitation, pirate party invite, pirate party invites, pirate party plates, pirate party stuff, pirate party uk, pirate princess party, pirate theme, pirates and princess party, pirates and princesses party, pirates parties, pirates party, pirates party ideas, pirates party supplies, princess and pirate parties, princess and pirate party, princess and pirates party, princess birthday party, princess party, princess party ideas, princess party supplies, princess pirate party, princesses and pirates party, theme party supplies, uk party shop, uk pirate party. Bookmark the permalink.